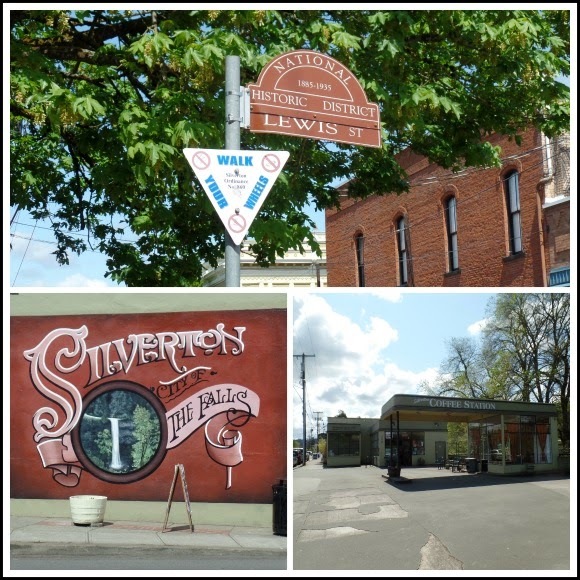 Since the hospital where I am having my gallbladder surgery is located in Silverton, Oregon, I have taken plenty of trips into Silverton this past couple of months,and thought I would share some of the pictures of this very pretty little town. The first time we ever visited Silverton was quite a few years ago, and we found this little park right in town. 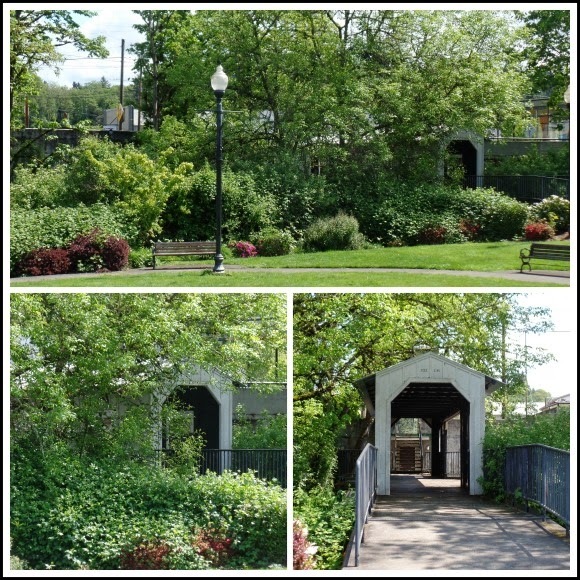 This little park has a covered walking bridge that goes over the Silver Creek that runs through Silverton. I love covered bridges, and this is a fun little bridge to walk over. So now, just about every time we drive through Silverton we stop at this park. 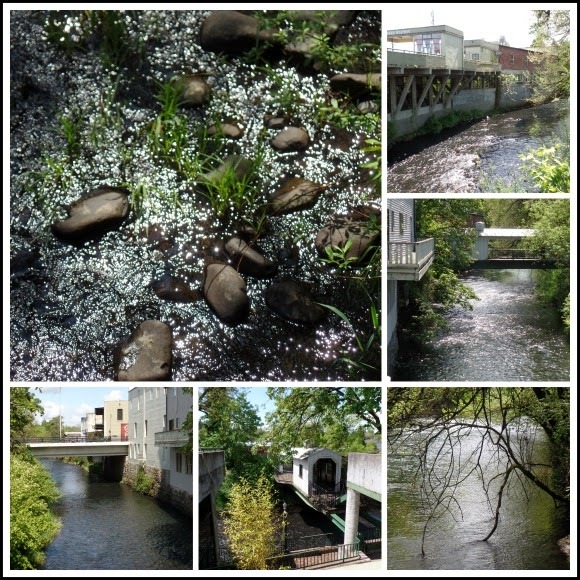 The bridge goes over this pretty creek that runs right behind all the businesses right on the main road through town. It is neat to look down the back of all the buildings, many have decks that look out over the water, although they don't look like they are in use any more. The last time we went, the water was sparkling in the sunlight. 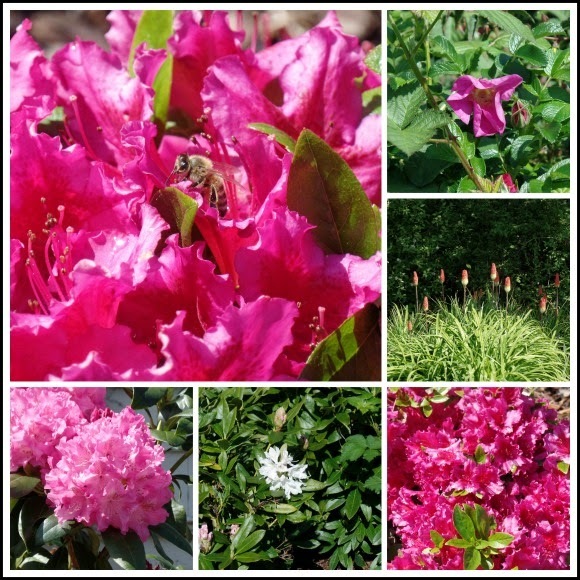 There were pink blooms all through the park - the Rhododendrons and Azaleas all looked very pretty, as well as all the other pretty flowers and shrubs. 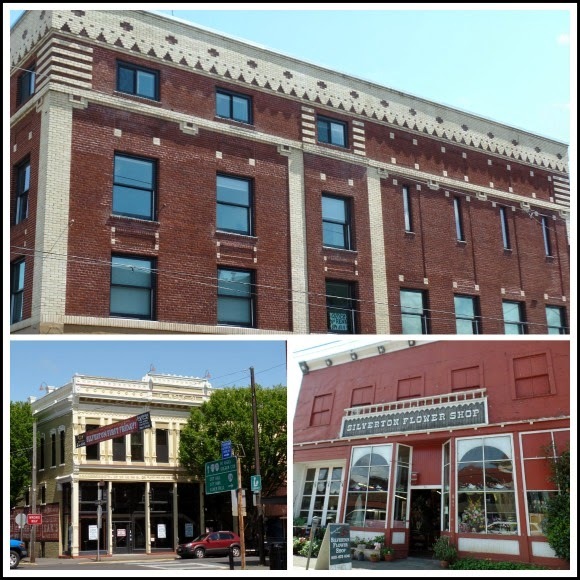 The buildings all through Silverton are older and have a lot of character, I love just walking through town and driving around and seeing the different building designs. There are also many different murals painted throughout the town you can take a walking tour of the murals and read information all about the different murals at the Silverton Chamber of Commerce Website. The murals are all interesting and have historical significance, since I enjoy history, things like these murals are really enjoyable to me. 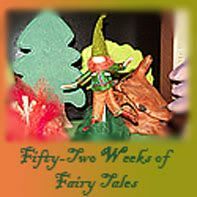 The other thing I enjoy in Silverton are all the fun little shops, I love walking through the different antique shops, there is also an old historic movie theater in town which we once went to with friends of ours to see The Pirates of The Caribbean, the theater only shows one movie at a time, but it has a wonderful old fashioned feel to it, and was a fun place to go to the movies. There are plenty of different coffee shops and cafes throughout town too, I haven't had the opportunity to visit many of them, but last time we were there we tried out a coffee shop that was housed in an old gas station. It was fun trying out a new coffee place and walking around the downtown area. 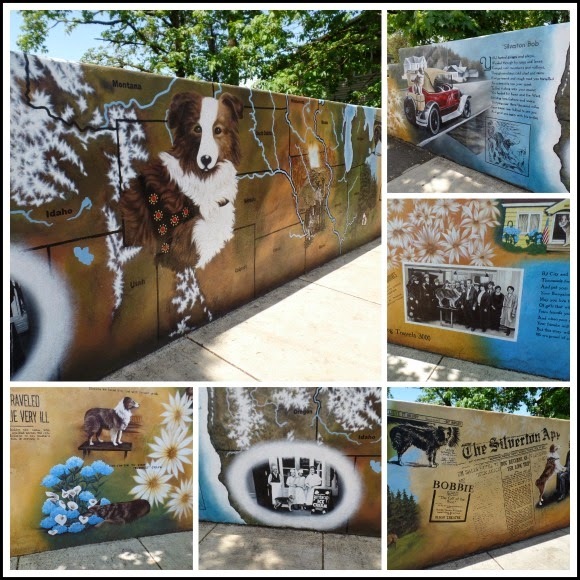 One of the most interesting murals I saw on this last trip was a long wall painted with a very large mural telling the story of Bobbie the Wonder Dog, who got separated from his family on a road trip to Indiana, and he made his way all the way to Silverton, Oregon back in 1923. He became very famous for his astounding journey of 2,551 miles, even Rin Tin Tin laid a wreath at his grave, Bobbie was laid to rest in Portland in 1927. You can read all about this story at Bobbie The Wonder Dog's Wikipedia page. I thought this was a pretty interesting story, and without the historic mural I would probably have never known about it. I look forward to exploring the rest of the murals this summer.